If something goes catastrophically wrong during one of NASA's upcoming commercial spacecraft launches, the crew will need to get clear of the launchpad -- and fast. But they won't be doing so in the lumbering old M113 Armored Personnel Carriers that they used during the Shuttle era. Heck no; if these Mine-Resistant Ambush Protected vehicles are good enough for the LAUSD, they're damn well suitable for our astronauts. 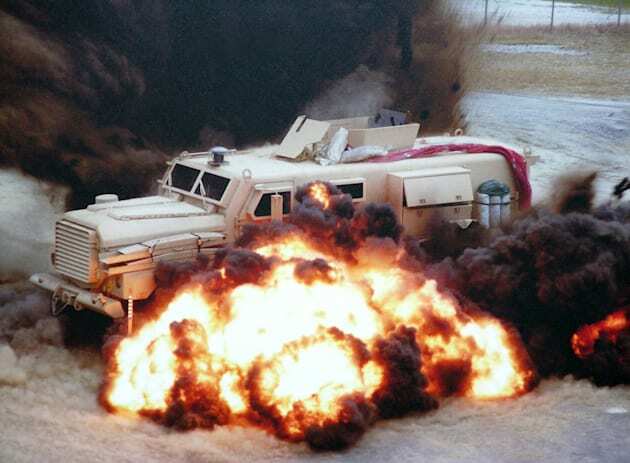 The MRAP is a 45,000 pound beast of a truck that was originally designed to ferry troops through war zones without fear of IEDs (roadside bombs) or ambushes. Now, NASA wants to use them as mobile fallout shelters should things go sideways during a launch sequence. The heavily armored vehicles may not look it, but they're surprisingly nimble with a 50 MPH top speed. In fact, during recent testing ahead of the planned start of the Commercial Crew Program in 2017, NASA engineers found that a fully-laden MRAP was actually a bit quicker than they had calculated. "Knowing how long it takes to get a person from the pad to where it will be safe is critical in our risk reduction for the crew," Steve Payne of Commercial Crew, said in a statement. "You can draw lines on a map all you want, but until you get out and run the course in real-life conditions, you don't know. You think you know, but you don't know." What's more, because the MRAP can be driven like a regular truck rather than a tank -- as is the case with the M113 -- anybody from the crew or support team can operate it in a pinch.